After their catchy meeting in Romania in 2013, where it immediately connected, Aurélie Charneux and Silvia Guerra decided to go beyond origins and to explore their past. 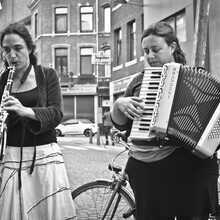 They share the sense to return to the origin of klezmer, a pure and simple form. The result is a cross between souls, with (ir) relevant and touching (foot) notes.Their music wants to give blows of truth, whisper the delicacies of life and cry out the beauty. 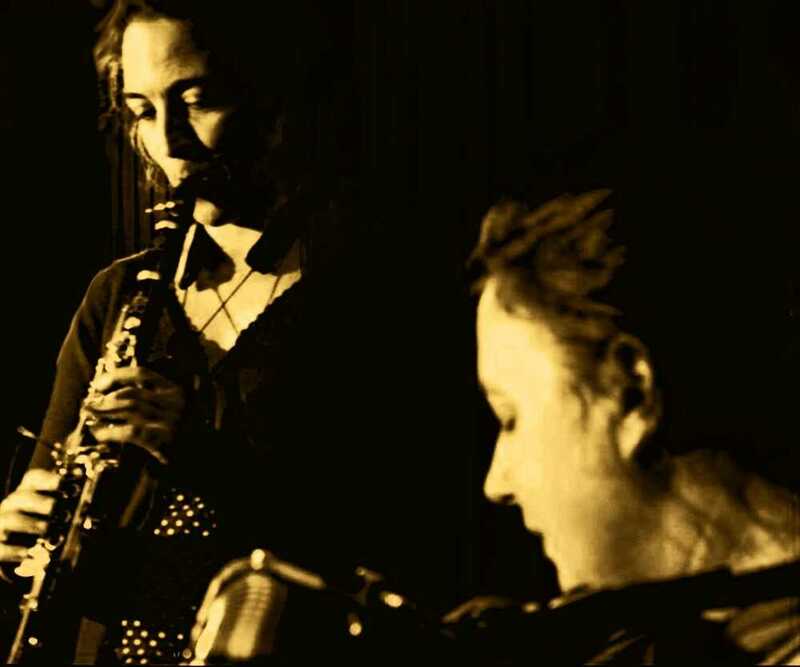 Aurélie and Silvia stand in the gap for the rights of visionary minorities, blown out visions and suffocating horns.Because of the need for humanity, sensitive towards the other, through music and with their own words, they speak the language of others who speak to them deeply. Aurélie Charneux was eight years old when she started playing the clarinet. She attended a classical conservatory training in Mons and Liège. 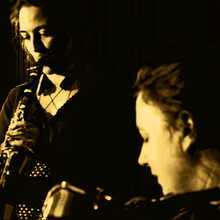 In addition, she followed improvised music with Michel Massot and Garrett List. Today she is active in a whole range of different musical styles. 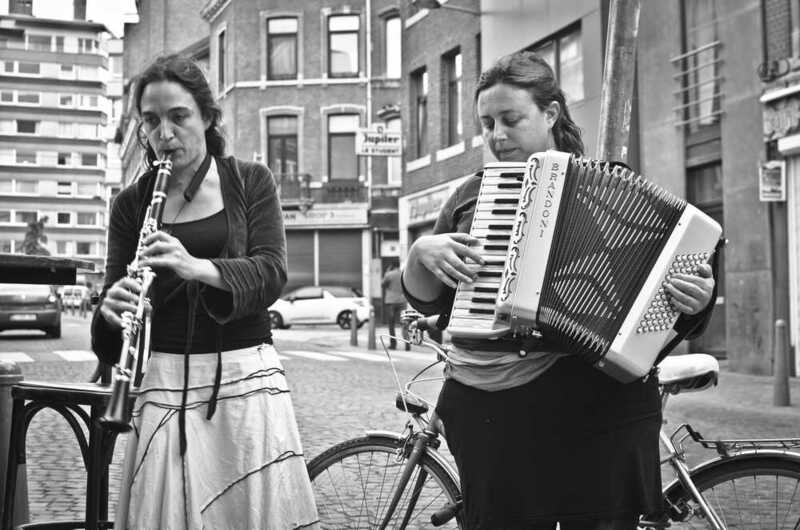 Occasionally she plays for the Royal Opera of Wallonia, but also in various groups for street music, in Cantata de Bisesero (Groupov), in the orchestra Vivo (Garrett List), with the singer Zahava Seewald, and so on.Aurélie has founded the klezmer group Klezmic Zirkus, for which she makes compositions herself and who has performed often in recent years. 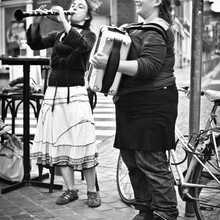 She also plays in the atypical duo Les Anchoises that proclaimed itself The Living Juke Box and recently in the duo Odessalavie. In addition to her study in plastic arts at the Academy of Fine Arts of Bologna (Italy), Silvia Guerra began to learn accordion. Between 1997 and 2002 she worked as a musician and actress with circus Bidon, the juggler Gino Rayazone (Marseille, FR) and the group Les Madeleines (French Pyrenees). She followed various clown courses, including Michel Dallaire and Caroline Obin.Then she went on tour for several years with various circus companies and a musical cabaret. In 2008, together with Maria Mazzotta and Marianna Melis, she founded the still active spectacle Cabaret Ritalia. 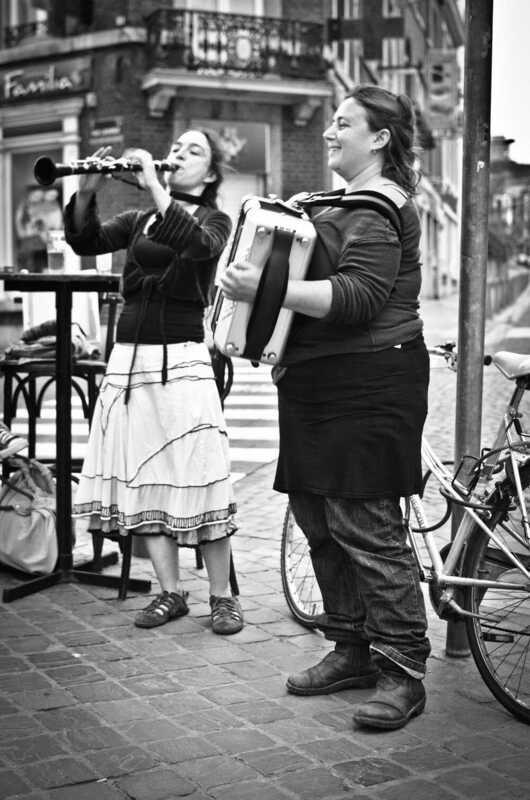 Silvia has been working with the Belgian juggler David Lippolis since 2012 for the street theater spectacle Pizza Lippo and since 2013 she plays in the duo Odessalavie.